Respond to our Survey for Parents and Kids to WIN #Giveaway. We want to create a fun and unique digital space where kids and families that love pets can be entertained, inspired and informed. As you can see on the Home Page and Menu, we are currently trying out a mix of Funny Videos, Factual Information and Videos, Sing-Alongs, DIYs, Crafts, Games and other content. We would love some feedback on what is working and what is not. Is the site easy to navigate? What content do kids like best? What do they like least? What is useful? What would they come back for? We would be very grateful if you would do our survey with your child to help us improve our Kids’ Pet Club Website, YouTube Channel and Content. The first 10 adults to complete the survey satisfactorily with their child will each get a C$25 VISA Gift Card, and everyone who completes the survey by August 31st will be included in a draw for a C$100 VISA Gift Card. We may also add more random prizes. Open to eligible US and Canada residents over 18 where legal. See full rules HERE. 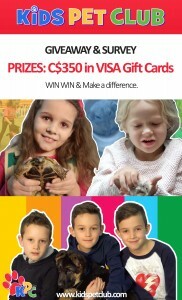 It’s a Win Win as you win a better Kids’ Pet Club for your child and you get a chance to win C$350 in VISA Gift Cards. Which websites for kids does your child visit? Which Device/s (mobile, computer) Does Your Child Use and Why (entertainment, research etc)? How does your child find websites or YouTube Channels - friends, school recommendations, with you etc? What types of How To's? Do they just watch or actually do them? Do you help? Any they like? Do you and your child like and understand the name "Ambassadors" for our kid experts/hosts? Do you like the name “Pet Pals” or “Mentors” or "Hosts" better or have a suggestion? Would your child want to be an Ambassador or Host and do posts and film videos? Is the name Collage Maker clear? Is the Collage Maker easy to use? What images did your child choose and were they happy with the result? Would they save it or print it? 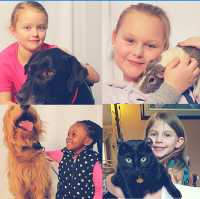 Sign up for Kids’ Pet Club newsletter? Read instructions for a craft or other DIY activity for your child? Print off instructions for a craft or other DIY activity for your child? Do a pet themed birthday party for your child? Order craft kits online for a kids’ birthday party or other event? Does your child watch YouTube videos? Do you have a GMail account that your child can use to subscribe or make a channel? Do you or your child subscribe to any channels on YouTube or do you subscribe for them? Do you put on playlists for your child to watch on YouTube or do they? What video did your child click on first? What are their favourite videos - animated, comedy, sing-alongs, TV shows, gaming, factual, DIYs, recipes? What are their favourite playlists on our channel? What types? Do they just watch or actually do them? Do you help? Any they like? Any other suggestions that could improve the site or YouTube channel for your child and on videos they would like? 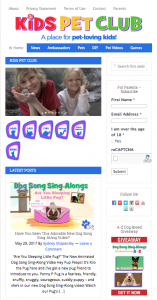 Do you follow any pages on Facebook about content or activities for kids or pets? How likely are you to follow Kids’ Pet Club on Facebook? Does your child have an Instagram account they use? Should we add a shop to the site? Any KPC products you think your child would like or you would like to get for them? Thank you and your child for your participation! I did a survey. How do I get my card? Thank you so much. We will be sending out the cards for the first 10 and making the draw for the big winner and any bonuses on Monday. My son had so much fun at kids pet club booth today at the pet expo. He took part in the sing along contest and can’t stop talking about it.